A broken, cracked, or chipped front tooth is commonly caused by an unanticipated encounter with something hard, such as a chicken bone. Or, being bumped while drinking from a bottle. Or, a bad fall on the street, etc. Dental mishaps of this nature can create a cosmetic crisis and quite possibly a very sensitive, if not outright painful, situation that leads to the dreaded emergency dental visit. At my office we handle a broken or chipped front tooth with a similar sense of scheduling priority as a toothache – namely, we try to get you in as soon as you can get here. Sudden damage to a front tooth tends to create a greater sense of urgency than say, a chipped back tooth. Even a relatively small chip in your front tooth can lead to an outsized sense of panic. After all, your smile is front and center for the world to see. And, to your tongue and lips, the jagged gap is a tremendous inconvenience. 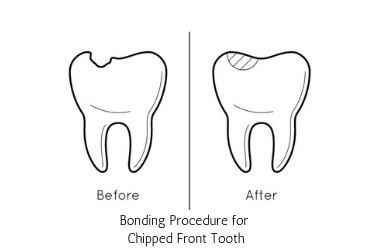 The remedy for a chipped front tooth can be a simple, elegant bonding procedure, porcelain veneer, a ceramic crown, or more involved treatment such as root canal. Sometimes a tooth replacement with a dental implant is required, depending on how severe is the chip, fracture, or break. However, it is not damage to a front tooth resultant of a sudden mishap that I devote this treatise to, but rather to the more gradual deterioration, wear, chipping, and cracking that occurs because of bruxism. Bruxism is what’s referred to as a parafunctional habit. Unlike eating, talking or swallowing, bruxism itself has no functional purpose. But, it causes systematic rubbing of the upper and lower teeth together with varying degrees of force during the night (nocturnal bruxism) or during the day (awake bruxism). Accelerated wear – on the biting surfaces of your teeth. Dental abfractions – notches along the gum line that look like someone took a mini-hatchet to the base of your tooth as if it were a tree trunk. Sensitive teeth – when tooth enamel wears so thin that the sensitive dentin underneath becomes exposed. Loose teeth – very common amongst bruxers. Sore jaw muscles – some bruxers can generate forces in excess of 500 lbs. per square inch – more than enough power to wreak severe damage over time. Enlarged jaw – your jaw muscles are like any other muscle in your body; the more you use it, the more developed, larger and stronger it can become and actually change the shape of your jaw. Now back to the original premise of this discourse. Besides a sudden encounter of the hard kind, the leading cause of a cracked, broken, or chipped front tooth is bruxism. Minor chipping that occurs over a long period of time can result in your teeth getting shorter. Enamel is the hardest substance in your body, but the tooth structure underneath it is soft. When your teeth grind and gnash against each other continuously over an extended period with an increasingly stronger force, enamel become thinner and thinner. Once the tooth enamel is worn through, wear accelerates even faster. Acidic foods make the situation even worse because they demineralize and further soften the tooth. 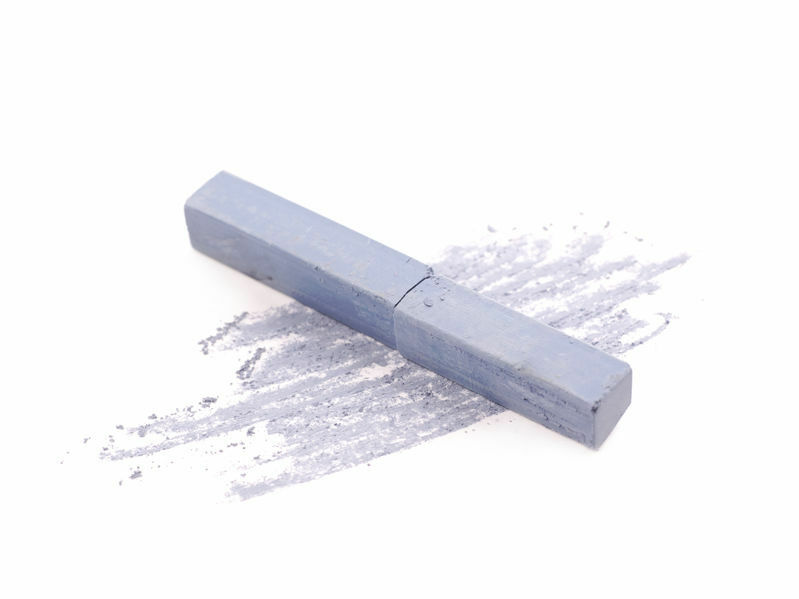 Imagine what would happen if you rubbed two large, pieces of chalk together. Chalkdust sprinkles and the chalk pieces gradually get thinner and thinner. Little pieces chip off or even an entire section breaks apart. Attrition is the technical term for the wear that occurs when two like and kind materials abrade away each other. This is what happens to your teeth over time when you have untreated bruxism. As wear continues, the incisal edges of your front teeth (upper and lower) become irregular in shape and rougher. As your teeth glide against each other, such irregularities in structure make them vulnerable to literally “catching an edge,” which causes the enamel to chip. 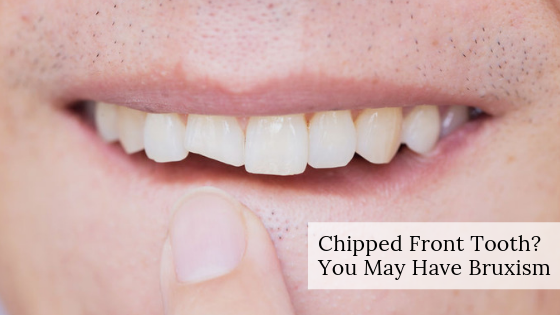 Usually, the chip is located at a corner of the tooth, but sometimes an entire piece of enamel cleaves off. Many people who brux are not aware they have the problem until symptoms appear. It can go undetected for years because the wear is subtle and happens over a long period of time. An effective way to demonstrate this phenomenon to the unknowing bruxer is to demonstrate how the chips in their upper front teeth fit into the irregularities and chips in their lower teeth like two pieces of a jigsaw puzzle. The precise matching of tooth wear patterns reflect the pathway of the lower teeth against the upper teeth as they machine each other over time. I’ve seen many patients whose bed partner told them about an awful grating sound that emanates from their mouth while they’re asleep. That’s the sound of enamel scouring enamel. As bruxism continues over time your back teeth can be affected, as well. Chipping and pitting (the development of shallow craters on chewing surfaces) will occur. As the tooth becomes thinner and the nerve gets closer to the surface, back teeth begin to fracture and become more sensitive. Sadly, we do not yet have a miracle cure for bruxism. But we do have numerous ways to treat it. Your dentist may recommend braces or remove an “offending” tooth. Botox injections can decrease the force of your jaw muscles. Biofeedback, meditation, and at-home exercises have been found to have a positive impact for some people. 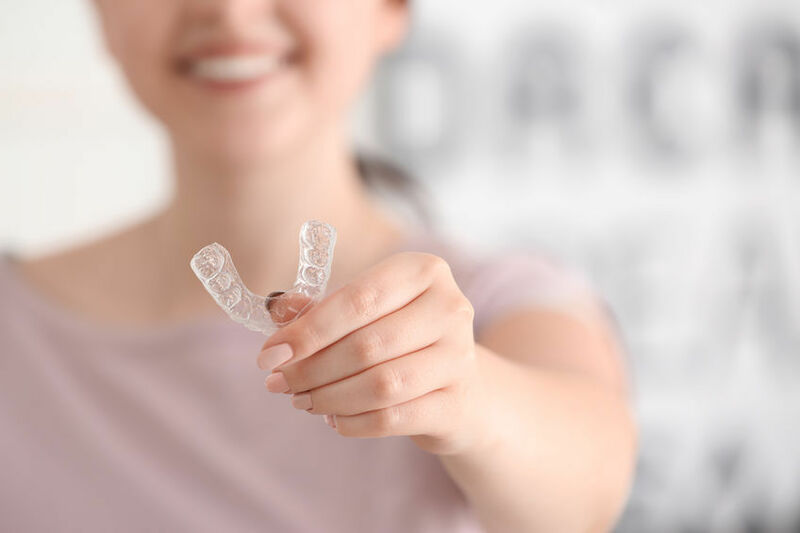 If you have a distinct chipped front tooth, if you have irregular edges and they feel flatter or sharper to your tongue than they once did, or if they look shorter, there’s a pretty good chance you have bruxism. Please see your dentist right away or discuss it at your next dental check-up (you do have an appointment, right?). Note: If you’re one of those people who is scared of the dentist, link here (it will make you feel better! ): Why Are You Afraid To Go To The Dentist?